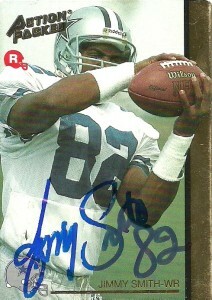 I had gotten Jimmy at training camp all those years ago in 1992 on a Classic and ProSet card. At the time Action Packed had missed the boat- just barely, on releasing a card in time for the start of training camp. I never was able to get back around to Jimmy, whether it was due to injury at camp or a matter of seeking the bigger plate, it just didn’t happen. It was a wild ride for Jimmy since his departure from the Cowboys, battling his way back up the NFL ranks, through addiction and incarceration to where he is today. I had given up long ago in getting him to sign TTM since he’s been so enigmatic. I decided to do a paid signing through Gameday Sports Tours when I saw that he was available. As a member of the board that they are a part of, Gameday even offered me a slight discount, so I went ahead and got a second card signed. Gameday was quick and prompt with returning my autographs after the event. I planned on using their services again or attending an event in person, but after later reading a frustrated rant from the owner of Gameday on Texas Autograph Club characterizing some people who attend his free events as loafers who take advantage of him, I postponed those plans indefinitely.